Showing posts with label social media. Show all posts. The marketing technology (martech) industry has seen $44B in total all time funding. Let's examine the investors financing the martech sector and identify the most active firms. 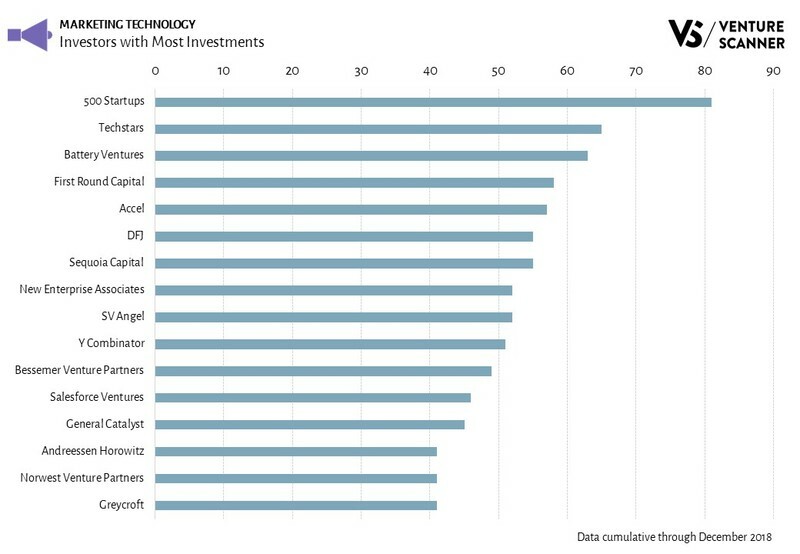 The graphic below highlights martech investors based on the number of investments made in the sector. If an investor participates in two investment rounds in the same company (such as a Series A and Series B), that would qualify as two investments for this analysis. 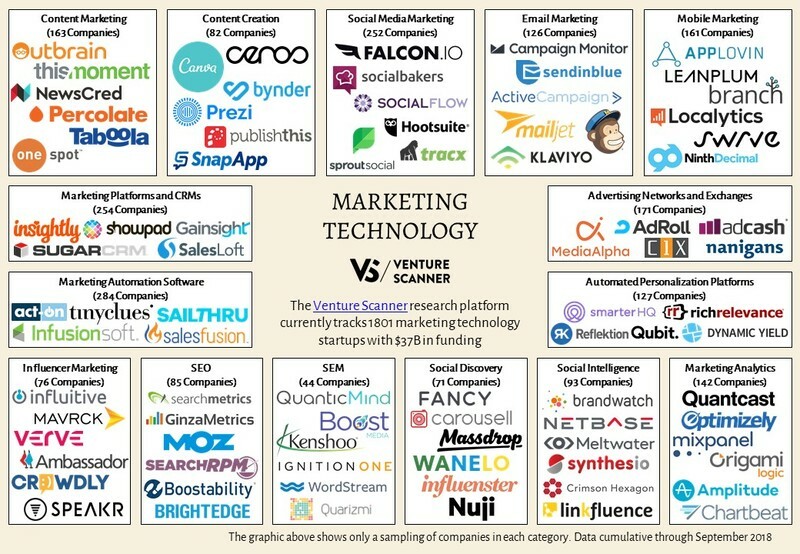 As the graphic demonstrates, 500 Startups has made the most investments in the martech sector with 81 investments. Techstars follows with 65 investments. Examples of companies that 500 Startups has invested in include Carousell, SendGrid, and ToutApp. Salesforce Ventures is a notable Corporate Venture Capitalist (CVC) on the list. The marketing technology sector has seen an abundance of activity over the past few years. The blog post examines the different components of the martech sector and how they make up this startup ecosystem. We will illustrate what the major sector categories are and which categories have the most companies. We will also compare the categories in terms of their funding and maturity. Let’s start off by looking at the Sector Map. We have classified 1801 martech startups into 15 categories that have raised $37 billion. The Sector Map highlights the number of companies in each category. It also shows a random sampling of companies in each category. We see that Marketing Automation Software is the largest category with 284 companies. These companies enable marketers to automate or enhance the process of inbound and outbound marketing. Some example companies are Sailthru, Infusionsoft, Tinyclues, and Salesfusion.